MORE employers expect to hire than fire over the next three months, according to Manpower’s Global Employment Outlook, a quarterly survey of over 65,000 employers across 41 countries. The net employment outlook—the balance of employers expecting an increase in the size of their workforce over those expecting a decrease—is positive in 32 of the economies surveyed. 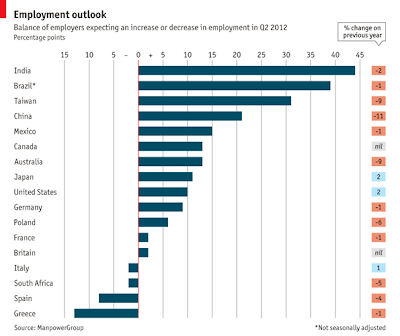 As our chart shows, hiring expectations have dropped in many places over the past year. However compared with the previous quarter, hiring optimism has strengthened or stayed the same in most labour markets. Hopes are highest in India and Brazil, driven by the services sector: nearly 6 out of 10 Indian employers in the service sector plan to expand their workforces before the end of June. In China, under pressure to improve salaries and working conditions, companies are not hiring as aggressively as they have in the past. Job prospects in the United States remain weaker than before the recession, but the outlook is the most optimistic it has been since the last quarter of 2008. Unsurprisingly, Greek employers remain gloomy, although fewer expect to be making further redundancies in the second quarter.